The Grand Ballroom is adjacent and privately connected to the luxurious The Montcalm London Marble Arch Hotel. This luxurious 5-star hotel is synonymous with exceptional service and spectacular style. Guests who stay at The Montcalm London Marble Arch are delighted by the deluxe amenities and splendid surroundings in the chicest of settings. Each room benefits from iPod docking station, in room personalised scented aroma, complimentary WI-FI, Nespresso machines, Elemis and Hermes toiletries. With 153 rooms, a luxurious spa and fine dining restaurant, The Montcalm London Marble Arch offers spectacular surroundings to ensure The Grand Ballroom will sparkle and shine for many years to come. The Montcalm London Marble Arch Hotel offers a superb choice of luxurious accommodation, all with an emphasis on style and comfort. The bedrooms are tastefully designed and lavishly furnished with magnificent bathrooms and rain showers reflecting the latest in design and technology. Indulge yourself and choose an aroma for your room from our selection of 'five senses' exotic fragrances. All suites offer a butler service for the ultimate indulgence in your spacious, private haven of luxury. 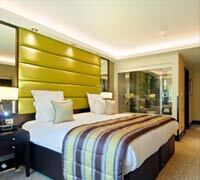 Each suite is individually designed with original artwork, sumptuous fabrics and state of the art technology. The opulent bathrooms features Gessi rain showers with hydro massage system and chromatherapy lights.